Here is the radiant point for the famous Perseid meteor shower. The 2010 Perseid meteors are peaking over the next few days. As always, you will see the most meteors between midnight and dawn. The morning of August 12 should be good. The morning of August 13 might be best for watching meteors. You might see meteors on the morning of August 14 as well, although the Perseids do tend to fall off rapidly after their peak. Why are meteor showers best after midnight? One way to think about it is this. The shower’s radiant point – the point in the sky from which the meteors appear to radiate – needs to be above your horizon before you can see the most meteors. Today’s chart shows the radiant point of the Perseid meteor shower – in the constellation Perseus the Hero – ascending in the northwest by about midnight and highest in the sky before dawn. The Perseid meteor shower is named for this constellation. Do you have to be able to identify the radiant point, or the constellation Perseus, to see the meteors? No. The meteors will appear in all parts of the sky – especially between midnight and dawn on the mornings of August 12 and 13. If – just for fun – you do want to spot Perseus, look first for the W-shaped constellation Cassiopeia. 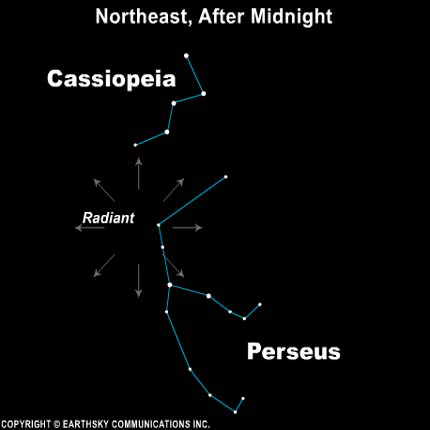 The constellation Perseus is faint, but Cassiopeia is noticeable and can help you find it. If you do see a Perseid meteor, and trace its path backward, you will find that it radiated from a point in the sky within the boundaries of the constellation Perseus. The good news this year is that the waxing crescent moon will have set by the time the meteors start flying. Moonlight can drown a meteor shower from view, but that will not be a problem in 2010. Any night that is free of cloud cover between midnight and dawn on Thursday, Friday and Saturday should offer a decent showing of Perseids. And don’t forget to look for the moon and Venus in the western twilight on Thursday and Friday evenings! Many people look forward each summer to the Perseids. It is a great time to go camping. This shower always peaks around this time of year, and it reliably produces 50 or more meteors per hour at its peak, or an average of about one a minute. It is great fun to give meteor-watching a try. It is a chance to go to a dark site with friends and family – a chance to see some stars and enjoy the night air – and see some meteors. With no moon to spoil the show this year, 2010 should be a fantastic year for the Perseid meteor shower. Let us know if you see any!